years before SA WAKAS, a musical featuring the songs of Sugarfree, came into fruition, there was an attempt to do a musical using the songs of the Eraserheads, the greatest band there ever was. and although elements in this pseudo musical were borrowed from Rent and Moulin Rouge with bits of variety show thrown in (obviously this was done haphazardly), the musical showed that the songs had potential to be transformed and woven into a narrative. here’s the result presented by GMA’s party pilipinas in september 2010 over a three week period, featuring gian magdangal, rachel anne go, lovi poe, mark bautista, jay perillo, geoff taylor, la diva, and ms ayen munji-laurel. as a fan of the eraserheads and of musicals, i was intrigued by this and i liked it. it helped that gian magdangal (im a fan) and ayen are musical theater people, plus rachel ann was more than capable of what she had to do with the role (she later played ariel onstage in the local staging of disney’s the little mermaid). with the APO songs made into a film musical in I Do Bidoo Bidoo and sugarfree songs made into SA WAKAS, i dont see why we cant have a real eraserheads musical any time soon. please watch it in hd (720). cheers! first of all, the songs are all great. credits go to ebe dancel, lead singer of the band, who wrote most, if not all, of the band’s material. he even wrote a gorgeous new song for the musical. the performers were actually good. we watched the 3pm show on april 13th. the lead cast were played by the handsome fred lo (playing the lead guy, topper), laura cabochan, and justine pena. 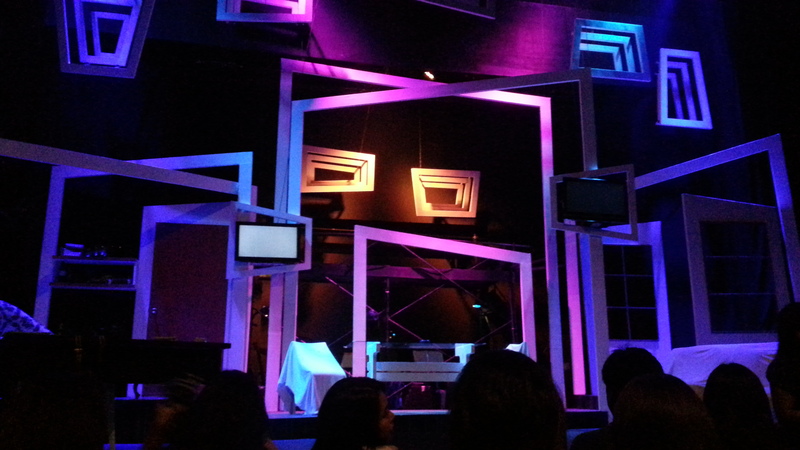 both laura and justine are familiar faces as ive seen them in ateneo stage productions before. act 1 was just confusing. *spoilers* the story flow apparently was running in reverse so we started sa wakas (the end) and ended SA WAKAS dun sa simula (at the beginning) but this was only evident when you get to act 2. in the meantime, you sit through the first act lost and angry. you cant even latch on emotionally to any of the characters because theyre all so bitter and vile at each other and you dont know why there’s too much hate going on. when the first act ended, carlo and i were looking at each other and just going, what was that?! we actually contemplated on leaving right away. eventually we decided to change seats and sat at the balcony and waited to find a clearer perspective on things. as act 2 progressed, i was telling myself this scene or that song should have been in act 1 so we could understand and appreciate the characters and situation better. it perhaps was only in the middle of the second act that you realize the story was in reverse. you go, oh, so that’s why, except that you’ve already hated the whole thing and are not sure if you’ll still like it. and the characters turn out to be actually sweet and funny and it’s supposed to be bittersweet knowing in the end they do separate. the only thing bittersweet about it is that this could have been great if the treatment wasnt pretentious and didnt try to copy “The Last Five Years” or something like Nolan’s “Memento.” i dont really see it as “groundbreaking” since the reverse treatment was not really effective. having said that, i think the last half of act 2 was really great. you finally get a clearer sense of who these characters are, what makes them tick and why you should fall in love with them. that scene with topper and gabbi on the rooftop was fantastic and the anti-hipster hipster lines were great. basha and popoy gets special mention again as lexi plays out a dvd of “one more chance”. you probably would still like to whack the lead guy in the head for cheating on his girlfriend and then you remember it didnt even go very well in the end at the beginning so what’s the point? the play’s treatment will indeed make you forget the bad things that happened in the relationship shown in the beginning but sometimes also, less is more. im mightily curious though of what victor robinson iii (alternate for topper) would bring to the show, knowing he’s a really good PETA actor. the reviews during press night on robinson were not very favorable but maybe that’s just first night jitters. most of the reviews on SA WAKAS were positive though, including feedback from friends who’ve watched the show. i thought it was just carlo and me who didnt like it (and few of the people seated behind us in the theater) then i read this review from broadwayworld.com which shares my sentiment. the cast during curtain call. 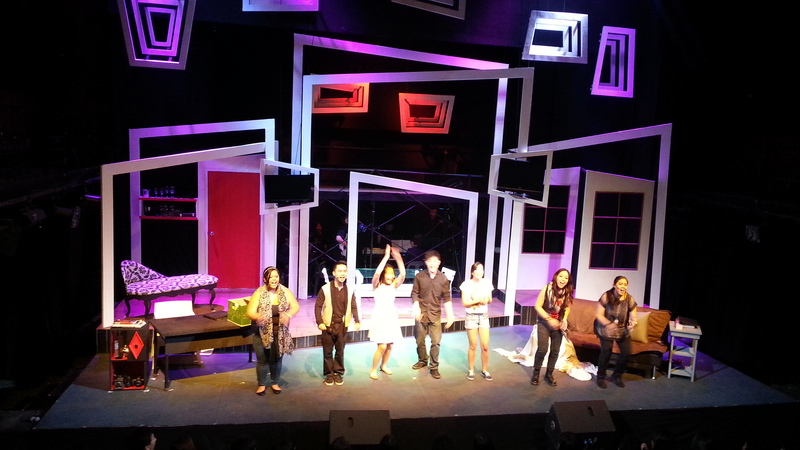 from left: hans dimayuga, cassie manalastas, laura cabochan, fred lo, justine pena, mikou david, and abi sulit. my friend, mikou david, is actually in the chorus and i congratulated her after the show, but i knew id be writing a not so great review of the show and i couldnt tell her that at that moment. also, one thing we noticed when we got in was that the set was tightly packed and some elements werent maybe necessary. we’ve seen a lot of productions mounted on the PETA theater stage but this felt too cluttered. i was actually looking forward to this because im still waiting for the songs of the eraserheads to be made into a musical and this would be a fantastic appetizer. if the creators would explore a different treatment to act 1 maybe id sit again and watch this musical. i really wanted to like this and my reaction was not what i hoped for. here’s wishing for a miracle. in the meantime, im gonna wash off bad vibes with a dose of sugarfree’s dramachine album. cheers! the first day of touring the temples in siem reap cambodia was spent on exploring angkor wat, perhaps the most famous of the temples in the area, this despite the bigger temple is angkor thom. buying our tickets the day before the tour allowed us to visit the site for free that afternoon and catch the sun set. im glad we took this trip. it’s the first time my mother’s been out of the country for a very long time and one where we family were almost complete. we came back early the next day to catch the sun rise over the temple. a lot of people came while it was dark. 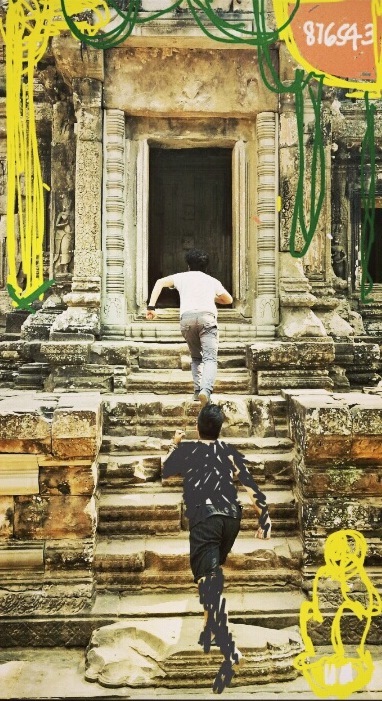 ive blogged about what the trip to siem reap meant to me here. A few months ago, we were on the search for furniture to rent for a tv commercial and found ourselves at our suking tindahan antique furniture store again. the items we wanted were not in the shop so our contacts led us to the showcase house behind the shop. We found this pewter and floral-printed fabric upholstered set we liked and a pair of stools in velvet that we needed for the commercial. i also took the opportunity to explore the house and rediscover its charm. a lot of antiques are lovingly displayed here along with contemporary art from local artists. the big painting is probably a john santos piece. One of angelo tabije’s paintings displayed in this bedroom (the one near the window). This was a finalist to metrobank’s annual art competition. at one point i actually wanted to have this but i didnt have money to buy it. oh well. Another of angelo tabije’s paintings in the main living room. This one depicts angelo’s pregnant wife, cecil.